Larry, what was that song called? So today I viewed the hottest song released this year on a YouTube clip recommended to me by a friend. The clip is of 62 year old civil rights activist “General” Larry Platt, in an American Idol season 9 “audition” performing the song Pants on the Ground. Obviously his isn’t really a true audition in that they were never going to let him continue on the show, but I’m glad they gave him his 15 minutes. ‘Cause that song’s damn catchy. And true. You ARE lookin’ like a fool with your pants on the ground!! With yo’ pants on the ground! Not sleepy? Tried counting your sheep? It is high time I shared the comics of Adrian Ramos on this blog. The first comic by Adrian (a.k.a “Adis!”) that I came across “back in the day” was Count Your Sheep, the cute, blue comic about a young girl called Katie and her best friend Ship, a sheep who hangs out with her and who lets her count him when she can’t fall asleep. 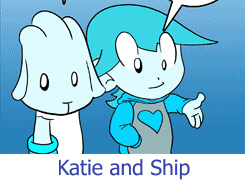 Count Your Sheep has a kinda Calvin and Hobbes feel, but with it’s own style both in the blue artwork and in the personality of Ship, Katie and her solo mum Laurie. I like the way that as a character Laurie too gets a real voice in the comic and isn’t just “the mean mum” or “the workaholic absent dad”. The second comic that I love by Adis! is No Room For Magic about a (human) girl called Magic who lives in a fantasy world, with a pixie mother, a wizard father, and a brother who’s a monster slayer in training – isn’t that an awesome premise for a comic?? the adventures of a merry band of boys and girls and the toys who love them. I haven’t read this one as much but it seems really cool and I love the way that the art in each of Adis!’s comics is really different, The Wisdom of Moo is drawn in a really cool, clean black and white style. Count Your Sheep seems to have kinda slowed down, with no new updates for a while, but it has archives back ’til 2003, so if you’re lookin’ for a fun new comic… Of the other two comics No Room for Magic has an archive that goes back to 2005 (but no new posts since September last year) and I think The Wisdom of Moo began in 2008 and is still updating at least once a week. Found this cool air hockey flash game. It’s pretty realistic – I still lose a lot, just like the real thing, but unlike the real thing this one has levels so for a while I feel like I’m pretty awesome. Sound can be toggled off by clicking on the ‘menu’ on the lower right, so it can be safe for work. Apparently there’s no NZ air hockey team though, sad. It’s that time of the year again and whether you’re getting your booklist sorted for heading back to school or looking out for some awesome summer reading, before you head out to Whitcoull’s or Borders try searching GoodBooksNZ.co.nz. Good Books is an online bookshop run by the charity Oxfam, which works against poverty and inequality in communities in over 100 countries around the world. I’ve been using Good Books to order some of the novels that I plan to use for my uni studies this year, and I’ve found that not only is their selection as good, sometimes better, than that of Borders and Whitcoull’s, but their prices are much cheaper. The site’s really easy to use, with just one field to use to search by title, ISBN or author, and I actually found their ‘Tips’ section handy when I got stuck once. Every time anyone buys a book through the Good Books website, 100% of the retail profit from every sale goes to support communities in need through Oxfam projects. I really like the feel of the site and having everything in NZ$ is really nice. Plus it’s nice knowing that you’re helping a good cause, by doing something you have to do anyway, and probably for a better price than you would’ve got it otherwise. Delivery is free and the only downside is that you’ll have to wait 7-14 working days for delivery (from either the UK, US or Germany), however this is pretty much the same as Whitcoull’s, which has a delivery time of 10-12 days. No one at Good Books is paid and we have zero operating costs. All time, professional services and resources are donated. So next time you need a novel, non-fiction book, audiobook, or even a music CD, check out GoodBooksNZ.co.nz first. And if you’re not in NZ, they deliver worldwide. So go for it! Oxfam is a worthwhile cause but they are now acting more like a business than a charity and that is a concern. While as a rival bookseller I can see why he’s worried, I can’t help thinking that in this commercial world we need more charities “acting more like a business”, since that’s how real, sustainable change will be achieved, and networks established that will go some way to reversing the inequality in our current economic system. Rather than fight a system that privileges a few over many, we wanted to transform it from within to constructive effect. Now, each time you buy a book through us you challenge traditional barriers that prevent commercial involvement in reducing poverty. *All GoodBooks quotes were taken from their website. So how’s your day been? Anything great happen? If so, why not share it with the world! ItMadeMyDay.com is a website where people post things that made their day. Some of them are funny, cynical, cute or pensive. You can also rate entries on the site, check out the new ‘Hall of Fame’ for most popular posts, and share entries on Facebook or Twitter. I like the way that the posts remind you that life has it’s good times, and it’s nice getting a glimpse of a warm, bizzare or euphoric moment in someone else’s life. Today I was not feeling well, and while lying on my recliner, all three of my dogs came and laid on me and took a nap. IMMD. The crazy people who brought you (and, er, me) lolcats have a new site! It is called RoflRazzi.com and it lols celelbrities! Yay! I’ve checked it out and there are some pretty amusing pics. I mean, they’re no kittehs, but I can see that I will be checking back regularly. Here’s a couple of samples, coincidentally on a similar theme. Look! It’s Chuck Norris! And there’s Keanu Reeves! an online magazine which aims to inspire, support, encourage and propel readers into the depths of their imaginations! The site certainly has many articles all written in Ivy’s own very readable and very affable style. In her catalogue she has Advice, How-tos, Beauty tips, a food section and an Artist of the week feature and more. This connoisseur of all things alternative also shares lots of great links to all sort of sites and personal tips on everything from online shopping to making your own greeting cards. Something Ivy uses a lot on her site and which is very reminiscent of every woman’s magazine you love is her wee spreads of pictures she has collected from around the web to accompany certain articles, like her spot-on take on “the whole cherry pinup look”. So next time you’ve got a free minute (or 30), head on over to Ivyology and check out an easy-to-navigate, personal site with a lot to offer!